As with all cancers, most experts agree that early detection is the key to increased survival with lung cancer. "The survival rate for breastcancer is incredibly high because of early detection and screening programs. Lung cancer, however, is usually not detected until it is at avery late stage," explained Kirk Mundy, vice president of marketing at Riverain Medical (Miamisburg, OH). "Only about 16% of cases of lung cancer are caught at stage 1. Coincidentally, the overall 5-year survival rate for lung cancer is roughly 16%. But if you catch it in stage 1, when it is very subtle and there are more treatment options available, the 5-year survival rate more than triples to 49%." "I also think lung cancer has suffered somewhat from the stigma of the connection between smoking and lung cancer," Mundy continued. "Smoking is a cause, but approximately 15% of people with lung cancer have never smoked. That's 25,000 patients each year, and they are diagnosed just as late. All cancers benefit from early detection, and I think lung cancer will prove to be the same." Lung cancer is most often diagnosed via a chest X-ray, sometimes as an incidental finding during an examination for another cause. In the United States, "the chest X-ray is the most common radiologic procedure," said Mundy, "with 80 million studies performed each year. Most of the time, the doctor is not specifically looking for pulmonary nodules-although they're always on the look out forthem-but they're evaluating a persistent cough or fluid or chest pain for which the chest X-ray was ordered." In these studies, subtle nodules may be found. To assist radiologists in the detection of these small lesions, Riverain Medical has developed the OnGuard Chest X-ray computer-aided detection (CAD) software. Like CAD systems used in other imaging studies, the OnGuard software uses proprietary algorithms to analyze the image. It then places a circle around any area of suspicion. To use the system, the physician calls up the patient record and reads the original digital radio graphic image (Figure 1A). After this read, the user then activates the software. If the system detects any regions of interest (ROIs), they are marked with circles on the image (Figure 1B). "The product puts a circle on the X-ray on a region of interest, which basically indicates, 'This looks like the thousands of nodules we've been trained on. You should take another look,'" explained Mundy. "It's not a substitute for what the radiologists do. It does not replace their judgment; it just calls additional attention to an area. The physician can then go back and either dismiss the marks or look at them further, based on what they already did." The system was designed to specifically target nodules in the 9- to 30-mm size range. "OnGuard CAD is trained specifically to lookfor early-stage nodules," said Mundy. "If a nodule is <9 mm, it's probably too small to be actionable. Nodules >30 mm are probably going to be caught by the radiologists on their own. So by focusing on the 9- to 30-mm size, the system can do a better job than by just targeting any nodule. If you have too many ROIs, the doctor is just going to disregard them," he added. "They appear to be random,and it slows down their workflow." In a recent study at the University of Chicago, 34 posteroanterior digital chest radiographs obtained in 34 patients (21 men, 13 women) with known nodular lung cancer were examined with the OnGuard CAD system. 3 The software was able to identify 12 of 34 cancers that had previously been missed by the reading radiologists, including 7 of 23 that were classified as "very subtle." "This study was not subjective," said Mundy. "They truly did miss these nodules because we know the patient got cancer in a certain spot later. The program caught 35% of those cancers, meaning that if OnGuard had been used initially, a lot of those patients would have had an earlier diagnosis." "The one caveat," he added, "was that there were too many false-positives, too many circles." According to the study results, the system averaged 5.9 false-positive marks per radio graph. "Interestingly, this study was done with an older version of the product," he noted. "Sothis issue has already been addressed by improvements to the latest version of the OnGuard product that is currently pending approval at the Food and Drug Administration." Mundy believes CAD has a potential role in screening for lung cancer. 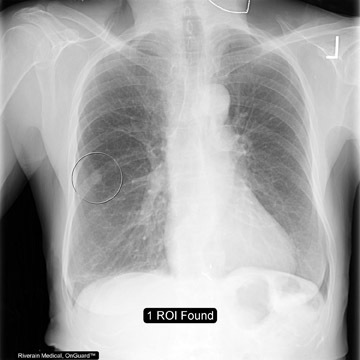 "The normal chest X-ray is not a very good screening tool," hesaid. "Computed tomography (CT) is very expensive and has a high dose of radiation associated with it. Applying OnGuard to an existing X-ray requires no extra procedure or additional radiation for the patient. It is a very practical alternative." "At Riverain, our technology base is pattern recognition," said Mundy. "We want to be a medical decision software company with a broad platform. We can apply our expertise to other modalities, other parts of the body, and conditions other than cancer. We're trying to change how physicians practice. We want to have breakthrough technologies that benefit patients-both large numbers of patients as well as patients who are very critically affected. Lung cancer is such a devastating disease; it seemed like an obvious place for us to start with our technologies." "Right now, there's a big river of chest X-rays coming through radiology departments. What we've done is to put a little finer net into the river. The excitement is in the impact that this product can have on patients' lives," he concluded. "There is nothing more rewarding than to see how what you are doing as a company can impact a patient. Early detection of lung cancer makes all the difference for th epatient and his or her family. That's why we're in business." American Cancer Society. Detailed guide: Lung cancer--Non-small cell. What are the key statistics about lung cancer? Available athttp://www.cancer.org/docroot/CRI/content/CRI_2_4_1x_What_Are_the_Key_Statistics_About_Lung_Cancer_15.asp?sitearea=. Accessed July 5, 2008. Centers for Disease Control and Prevention. Lung cancer: Trends. Available at http://www.cdc.gov/cancer/lung/statistics/trends.htm. Accessed July 5, 2008. Li F, Engelmann R, Metz CE, et al. Lung cancers missed on chest radiographs: Results obtained with a commercial computer-aided detection program. Radiology . 2008;246:273-280. Technology and Industry: Use of CAD in lung cancer detection. Appl Radiol.